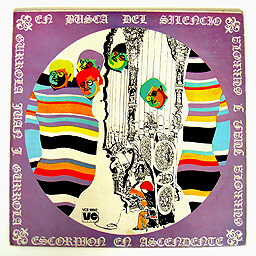 In Search of Silence – Scorpio Rising, is an LP recorded by the eclectic Mexican Theater Director Juan José Gurrola in the early Seventies with various friends (Victor Fosado: Percussion, Roberto Bustamante: electric Guitar, Eduardo Guzman: Trumpet). It is an unknown record, only a few copies were made. It is a rare example of Mexican experimental music, free jazz, alternative music, at that time. I consider Gurrola a pioneer of sound art in Mexico, along with Alejandro Jodorowsky who was a good friend of his back in the sixties. On 2007, the curator Mauricio Marcin did an exhibition of Gurrola’s artistic works and he asked me if we could make a CD of this forgotten LP, but inviting electronic composers to do remixes, sound interventions or works inspired in the different tracks of Gurrola’s LP. I had already suggested this to Gurrola, and so he agreed and I invited 20 Mexican people to participate. It became sort of homage to this grate interdisciplinary artist, that sadly died recently, just after the CD was published. Se podrá escuchar el disco En busca del Silencio/ Escorpión en ascendente grabado en los setentas por Gurrola, exploración musical denominada por él mismo como música neuro-atonal, y que Manuel Rocha, artista sonoro e investigador, define como “una música experimental muy libre, una especie de free jazz bastante avanzado que se mezcla con algo de pop con orígenes desconocidos”. Asi como una cinta muy rara de Via Lactea de finales de los 70’s.